It’s estimated by dating experts that 95% of people looking for online romance will join one of the top five sites. Which are the most popular and which aren’t worth your time? Dating Facts: Is Bigger Really Better? The Internet’s most popular dating services attract millions of singles worldwide with not just skilled marketing techniques but a wide range of unique and savvy features. As well as being some of the earliest pioneers of Internet dating (some going back to the mid 90’s), these sites also provide such things as professional, in depth personality tests or even an assurance of dating success with money back guarantees. Combining these things with state of the art features often provides a site’s members with the sense of confidence they need for a successful online dating experience. It’s estimated by some dating experts that the overwhelming majority of people seeking online romance will join one of the top five sites, while the remaining few will join one of the many thousands of smaller sites. The smaller sites can and do compete however, with many offering dating for specific niches, such as single parents or specific religions (see more). While the cost of membership for the leading dating sites can sometimes run a little higher, many find the perks, the number of potential partners, the ease of use and the sophisticated features well worth it. This is especially true for those who are serious about finding their romantic equal through online dating. That’s why I’ve put together a list of the biggest and best dating sites available on the Internet today. Match.com is one of the oldest and most trusted online dating services in the world. Since 1995, Match has offered its members an outstanding online dating experience, and their service is continually being enhanced with the latest technical innovations. Not only will those who join have access to a number of state of the art features, they are also privy to Match.com’s renowned guarantee of finding someone special within six months or receiving the next six months of membership free of charge. The site also gains much recognition thanks to a well put together and easy to navigate format. Members can easily create a comprehensive profile filled with their most essential information, upload photos and search for a compatible match just by keyword alone. Match.com has members numbering the millions, providing a good opportunity to meet an array of different people wherever you happen to live. An added bonus comes in features such as voicemail and video profiles which give members a more authentic feel to their online experience. Along with the dating aspect, quizzes, polls, forums and similar features encourage site members to take an active role in the online community. As one of the more established online dating communities, Match has earned a more solid reputation when compared to the many thousands currently in operation. Auto matching• Enhanced matching tools to make the search for your next loved one a snitch. Video• Have instant access to anyone you meet and get to know them face to face, via your PC webcam. Personalized• Getting stuck writing your profile. Don’t worry, Match’s team will even write your own profile for you. Daily matches• You’ll get up to the minute matches notifying you if new people joining the site satisfy your preferences. Does the guarantee work? To be honest most people don’t get as far as claiming it. Most find matches easily within the first 2-3 months (see some customer testimonials). In my view, those who don’t have extremely unrealistic expectations about who they are going to meet. A friend of mine has a list of “must haves” as long as her arm. She’s 48 now and still single! What about cost Match isn’t known as being an expensive site. That being said, it’s not one of the cheapest either. At less than $35 for a month’s use, it’s hardly more expensive than going to a movie or to a restaurant. eHarmony.com was established in 1998 by psychologist and relationship expert, Neil Clark Warren (Wikipedia), and is now one of the most well known dating websites both on and off the internet. The main feature that has won the site so much acclaim is its comprehensive personality survey that analyzes a number of traits in a person’s character. These aspects are then best matched with complementary traits of other members. According to eHarmony’s research, this ensures a higher quality match that typically leads to increased chances of a successful relationship in the long run. As all members are required to take the extensive personality survey, the site is an appropriate choice only for those who are serious about finding a lasting relationship. Eharmony.com has members numbering in the millions; however, the site is able to offer a good ratio of men to women. Rather than the traditional search through profiles, those who decide to join will be presented regularly with compatible matches. Members can then communicate but only if both parties agree. This keeps a member in complete control of his or her online dating experience. 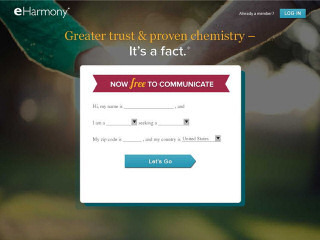 The subscription to eharmony.com could be considered somewhat higher than average (see cost details); however, the focus of the site is to provide a service with bona fide results. The number of successful marriages and relationships attributed to the company is evidence of their success. Joining• You start off with a lengthy questionnaire. This takes between 30 minutes and 1 hour to complete properly. It’s designed to pull-out your unique personality traits and character. Matching• You’ll receive matches based on eHarmony’s own matching formula. If you don’t like the people who’re being suggested to you, you can also set deal breakers. Communication• Once you’ve found someone, the communication can begin. You have the option of open or guided communication. Open, means you simply email one another. With guided, you each send each other some pre-formatted questions. What are the chances of meeting someone? eHarmony does have a strong track record. But, and this is the rub, it’s not for everyone. The matches you’ll have put in front of you are not necessarily people you would normally be attracted to. So you have to put faith in the system and go with an open mind. Many people who use the site find that they were simply overlooking people who were genuinely their type. Tinder is a “swipe to like” dating app that’s fast and fun. It doesn’t have the personality profiling and matching technology of the others but it makes up for that by it’s unique approach. 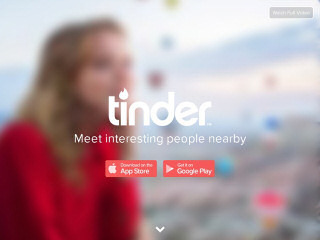 As you swipe someone into or out of your personal space Tinder learns from your actions. This means the more you use it the better it gets at finding people who you’ll find attractive. At least that’s the theory behind it. Though not everyone is convinced of Tinder’s benefits. Some say this has created a superficial experience where people just focus on physical appearance. Be in no doubt, if your photo isn’t totally captivating you can get overlooked. In my view if you’re just looking for a fun few dates with people nearby, you can’t beat Tinder for that. On the other hand if you’re after something more meaningful then you would do well to look at some of the more traditional dating sites like Match or eHarmony. Starting off• Tinder charges different rates depending on your age. Personality test• None as such because as the app learns what type of people you like based on your choices. 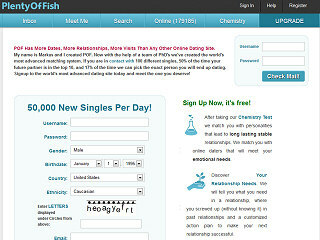 PlentyofFish.com was founded by computer programmer Markus Frind in 2003, and is now the largest and most successful free online dating site in existence. While other sites earn their proceeds from charging their members to use certain features, Plentyoffish relies heavily on advertising revenue to support itself. Up until 2011, its founder was running the site single handedly from his apartment in Vancouver, but due to the massive growth of the site, he has since hired some helpers. The site offers things such as email and chat at absolutely no charge. This can be a good option for those who want an online dating site with decent features but find themselves on a budget at the same time. Plentyoffish does have an optional payment called “serious intent”, which doesn’t grant any extra privileges, but simply indicates a member is genuinely seeking a partner. This was introduced to tackle the major problem faced by free dating sites of separating those members who are there for genuine reasons, from scammers, time wasters and the cheats who are there to take advantage of a free service. Plentyoffish is a very large online dating community and though the site largely caters to North America and the UK, one will find numerous members from around the world. To help make finding a compatible match easier, the site offers the chance to take a chemistry test. This unique feature uses carefully placed algorithms to analyze certain personality traits and characteristics. Upon completion, the results are then matched to members with balancing qualities. Once a week, compatible matches are sent to a member’s onsite email account where he or she can then decide whether or not to make contact. Getting in• Don’t be in a hurry to get a profile up! Make sure you put up something respectable otherwise, you’ll most likely get rejected. Due to Pof being free, many people don’t take it as seriously as say eHarmony where they have to pay. They put up silly, empty profiles which they rarely update or check.These zombie profiles get aggressively culled on a regular basis. This is to stop the site filling up with garbage. Premium• If you do go premium you get a bunch of additional benefits, like being able to see who’s read your emails and so on. To be honest, you can surely live without these things. The main incentive to upgrade is that it tells other people you’re serious. Ads• Being a free site means you do have to put up with the occasional advertisements here and there. Support• The main downer I found with Pof is help and support is in fairly thin supply. If they could fix this, it would be a massive plus point for them. The Friendfinder network is a popular dating and social community with members running into millions. Their mainstream site, FriendFinder.com offers all who join a place to not only meet someone special but an outlet for socializing and keeping up with friends. An easy going atmosphere presents an array of individuals of all sexual preferences who can choose whether they are looking for a serious romantic relationship or just friendship. In addition to this, it is possible to find members spanning across the globe. All this together can provide a number of possibilities needed for an online dating experience that yields positive results. Upon signing up, one can create a profile and upload their photo in a matter of minutes. 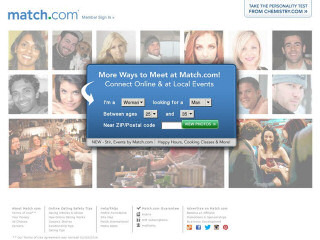 Searching by location, zip code or distance can be used to find a compatible match nearby; or, members can see who’s online or search the most popular profiles and use email and chat features for online fun. Friendfinder has a wealth of features such as blogs, forums, quizzes and polls allow members to stay involved and get to know the online community as a whole. 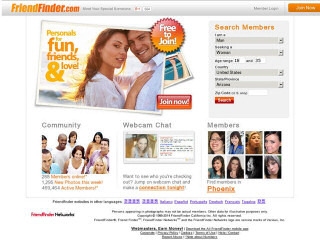 Though it is possible to maintain a free standard membership, a paid subscription provides access to additional privileges and features on Friendfinder.com and enables communication with all members. Free membership• You can start of on the standard (free membership) and can create your picture personal ad. While this lets you look around, you have some limitations. Full membership• Taking full membership lifts all limitations and is to be honest the only way you can properly use any dating site these days. Premium advantage• What’s good about going premium is that your profile gets a massive boost, appearing at the top of searches instead of buried down at the bottom beneath thousands of other free profiles. Socializing One thing Friendfinder sites are noted for is their social side. This one is no different and has a decent selection of blog writers, user forums, and interest groups. What’s the chance of meeting someone? Friendfinder attracts people looking for casual no strings relationships. It’s not the best place to look for your next spouse! However saying that there are people on there looking for serious connections, it’s just a matter of routing them out. E harmony is the only one for people looking for genuine, lasting relationships. The rest are a waste of time.